Odontites vernus subsp. serotinus. Close-up. Odontites vernus subsp. serotinus fma. alba. 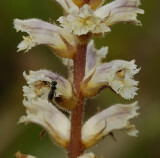 Orobanche minor. And its host Trifolium repens. Orobanche minor. Between its host Trifolium repens. Orobanche minor. Odd clone. Close-up. Orobanche minor. Piet Brouwer showing a group of large specimens. 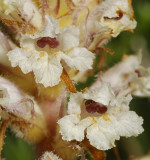 Orobanche reticulata subsp. pallidiflora between its host Cirsium arvense. Orobanche reticulata subsp. pallidiflora. At the base of its host Cirsium arvense. Orobanche reticulata subsp. pallidiflora. Closer. 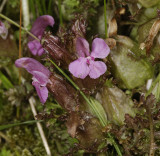 Orobanche reticulata subsp. pallidiflora. Close-up. Orobanche reticulata subsp. pallidiflora. With pollinator. Harveya huttoni. Close-up with hand.